International award winning author, Stephan von Clinkerhoffen, is a Peter Pan character. That’s why his sci-fi fantasy series “The Hidden city of Chelldrah-ham” suits younger readers and the “young at heart”. Clinkerhoffen’s writing, conceived from his love of mechanics, nature and art is tempered by humanity and fun. An Engineering background allows him to develop new ideas, learning from success and failure. He enjoys tinkering with classic cars and motorbikes, even built his own kit car. Through his art Clinkerhoffen embraces the challenge of painting intricately detailed fantasy lands which depict his novels. Clinkerhoffen spent several years volunteering with the New Zealand Red Cross after Christchurch’s earthquakes. Back in England after 14 years living in New Zealand he feels lucky to call the Cotswold countryside his home again. See link below to find out more about Stephan von Clinkerhoffen and “The Hidden City of Chelldrah-ham” series. The Hidden City of Chelldrah-ham series by Stephan von Clinkerhoffen continues with Book 3, Belas Rift. Through a swirling inter-dimensional portal, Stig and Meg find themselves in Anet’s world, Earth, or specifically England. The humans can’t see Stig and Meg. Except for their shadows, they are invisible just as Anet was invisible to them in their world. The pair runs into all sorts of trouble, trying to manage their way in the human world and learning about it as well. At the same time, the pair tries to stop Anet who’s hell-bent on destroying their Motherland. It’s interesting to see our world through the eyes of the two Manna. “It just tastes of salt and chemicals.” I find Stig’s disgust of a bag of chips amusingly satirical; we humans really need to lay off the junk food as well as other destructive habits. The growth of the protagonists’ characters and their relationships is deftly done. The wonderful descriptive quality of the narrative is maintained and is as engaging as ever, complementing the great artwork. There’s plenty of action and suspenseful moments in its appropriately paced plot, just like its predecessors. That said, Belas Rift is not quite a standalone. I do feel that readers need to read the series’ books accordingly to be able to grasp the unique and imaginative world-building, the continuation of the plot, and to be able to acknowledge the character development. On the other hand, there’s no doubt that Belas Rift is another solid work by Stephan. Fans of the series will not be disappointed with this third book. 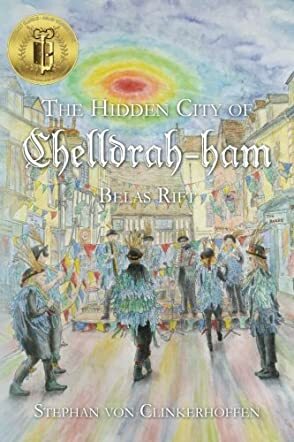 The Hidden City of Chelldrah-ham by Stephan von Clinkerhoffen is the third book in the Belas Rift series, an intelligently written and gripping tale that combines sci-fi with fantasy to score great success in entertainment. Readers follow two compelling heroes, Stig and Meg, chasing Anet, the evil one. They go through a portal that brings them to a completely new terrain and this spells trouble — it is Anet’s turf. This place called England could spell the defeat of the Manna and allow the evil woman to unleash her greedy creatures into Chelldrah-ham. Can the answer to their quest be in the Temple hidden deep within the earth, the temple that seems to beckon irresistibly to Stig? Can they discover what it takes to beat an enemy on her own turf, and what about the flying machine that keeps chasing them? This is a story with many twists and surprises, a work of great imagination that will take readers to strange and exciting places. I found the writing beautiful, the plot well-paced, and the conflict masterfully developed. The idea of the Manna was new to me — could it be the creation of the author? The conflict is so well developed it seems to be what holds the story together. It is interesting to see how the characters evolve through the conflict. They are so real that readers will not have a hard time connecting with them. The author has created very tight situations for the characters and it’s interesting to see how they manage to get out of these situations. Overall, The Hidden City of Chelldrah-ham is a gripping story with a huge potential to entertain a wide audience. Stephan von Clinkerhoffen creates a very delightful story and an enchanting setting for readers.